INDUSTRIAL UPCYCLING is the only existing systematic WASTE PREVENTION tool which can face the volumes of waste generated by industries and industrial players on local, so as global scale. Developed - Tested - Applied in various environments and industries, we proof it works and does not only decrease the negative impacts of industrial production and supply chains on the environment, but transform cost center (waste management) to profit center reverse sourcing of the On-The-Ground-Mines. 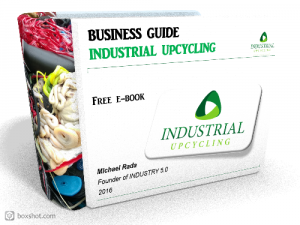 We have prepared for you FREE E-BOOK to learn about the principles, case studies and results of INDUSTRIAL UPCYCLING. Please feel free to download. If any questions, please do not hesitate to contact us for any details and support. Delve deeper into the secret of INDUSTRIAL UPCYCLING and open your way to improving your business! How to see the potential in areas where others just wave their hands? How to make more money at zero cost? How to increase labor productivity through smart change processes? To translate websites www.industrial-upcycling, please use the Google translator. When you see on the screen first big cross, just scroll down.